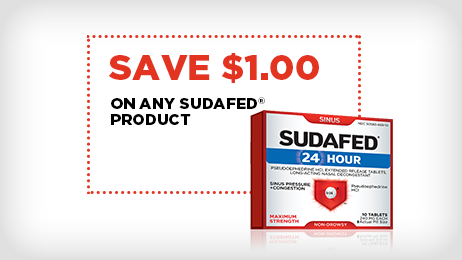 Save $1.00 on any SUDAFED® product. Pseudoephedrine, an active ingredient in some cold, allergy, and sinus products, can be chemically processed into methamphetamine (commonly known as meth). The illegal use of meth has increased in recent years, prompting Congress to pass the Combat Methamphetamine Epidemic Act of 2006 (CEMA). The objective of the law is to eliminate the use of pseudoephedrine in the illegal production of meth. By law, products containing pseudoephedrine must now be sold behind the pharmacy counter and through online retailers who must meet certain requirements. Note that products containing pseudoephedrine remain available without a prescription in most states. Do not use if you are now taking a prescription monoamine oxidase inhibitor (MAOI) (certain drugs for depression, psychiatric or emotional conditions, or Parkinson’s disease), or for 2 weeks after stopping the MAOI drug. If you do not know if your prescription drug contains an MAOI, ask a doctor or pharmacist before taking this product. We swear by this medicine! Works wonders for head congestion and general colds. Usually have relief within 24 hours. I don’t know why I even bother with other products when the first time I take one pill of this I see major results. I have taken 3 of the 12 hour pills and my cold side effects are 90% gone now! The best cold medicine on the market. 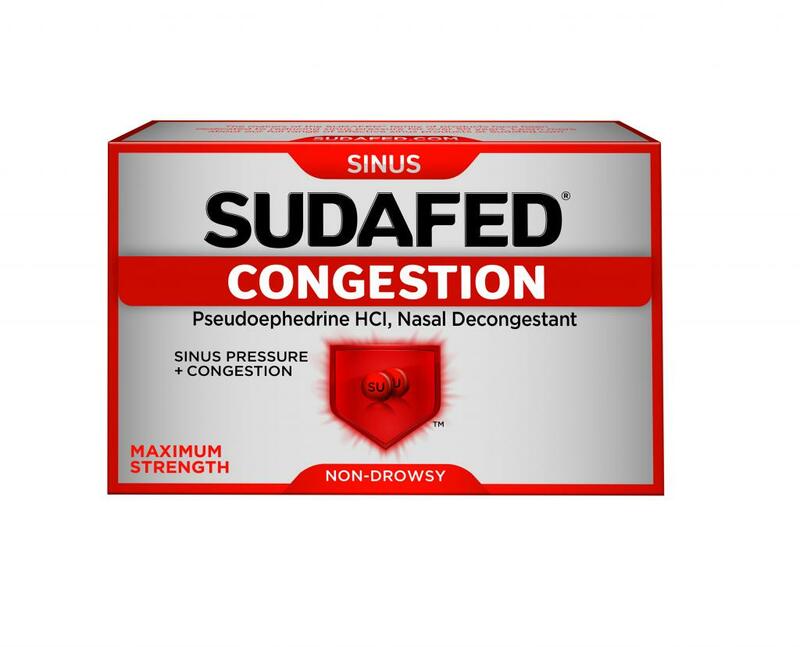 When I used to get congested, Sudafed (30mg PSE) was the best OTC product available. Relieved my pressure within a few hours providing much needed relief. I haven't been able to find this at my local drug stores for almost ten years. Is the 30mg product commercially available again in the US? This product did nothing for me. In fact, my congestion got worse. We’re sorry to hear about this! We’d like to learn more about your experience so we can help you, call us at 1-800-223-0182. We’re here Monday – Friday from 9:00 AM – 5:30 PM ET. Make sure to mention your preview profile name so we can link your review with your call. Talk to you soon! Did absolutely nothing for me. In fact, my congestion got worse. I have a deviated septum so I chronically get bad sinus infections every winter. Make sure you get this type of Sudafed behind the pharmacy counter cuz it literally is like MAGIC!! I was having so much pressure and pain on my face and within an hour it was relieved!! I will never use anything else! I can’t recommend this stuff enough!! This stuff works wonders. I know keep some in medicine cabinet for the next time I might need it. This website contains current product information and may differ from the information on the product packaging you may have. If you have any questions, please contact the Consumer Care Center at 1-877-895-3665.